Spoiler alert! A classic Marvel character gets killed in the pages of Secret Empire # 1 by Nick Spencer and Steve McNiven. And it was definitely a shocker. So first things first, it’s kind of weird to read a comic book where Captain America plays both the central character and at the same time the bad guy. My first impression is its another “the bad guys won” story but it has more meat. Still I can’t say for certain whether I like the event; the issue though is great. 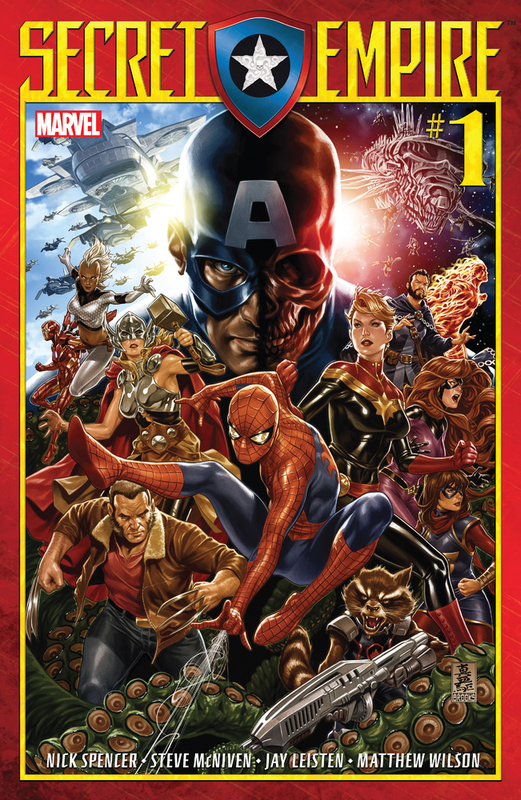 So in this “new world order” Captain America brought in after the events of Secret Empire # 0, HYDRA has taken over and the heroes have either been trapped or they have been recruited to join HYDRA and there are still some who have gone underground and become resistance fighters. That’s one of the plot points for the issue 1 but we’ll skip that for now. Another beat that we need to explore is the obligatory character death. 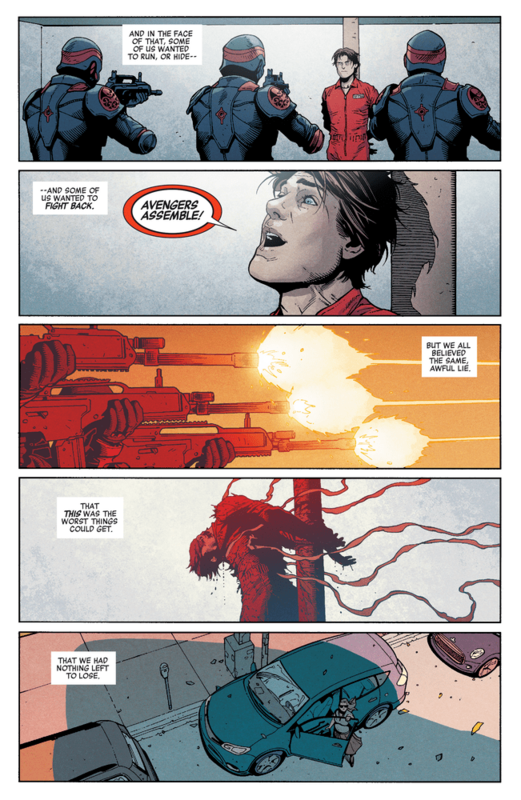 For Secret Empire # 1 it had to be Rick Jones. 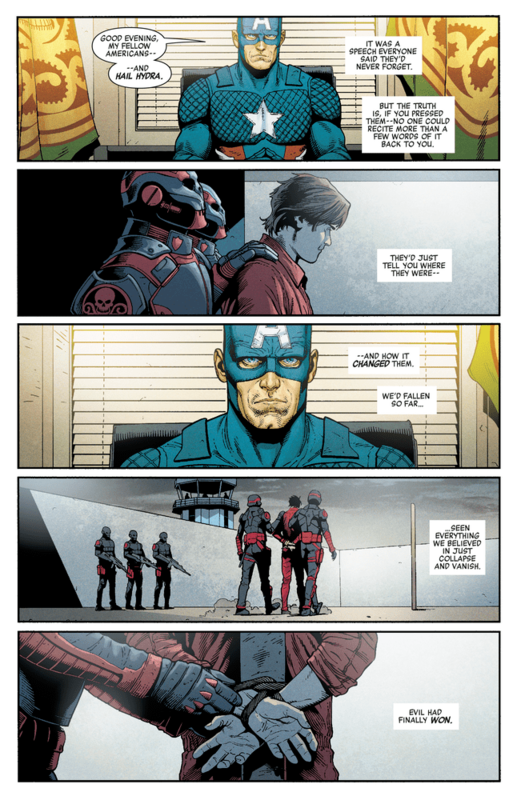 The main HYDRA council wants Steve Rogers to be ruthless and to do that they need to make an example. 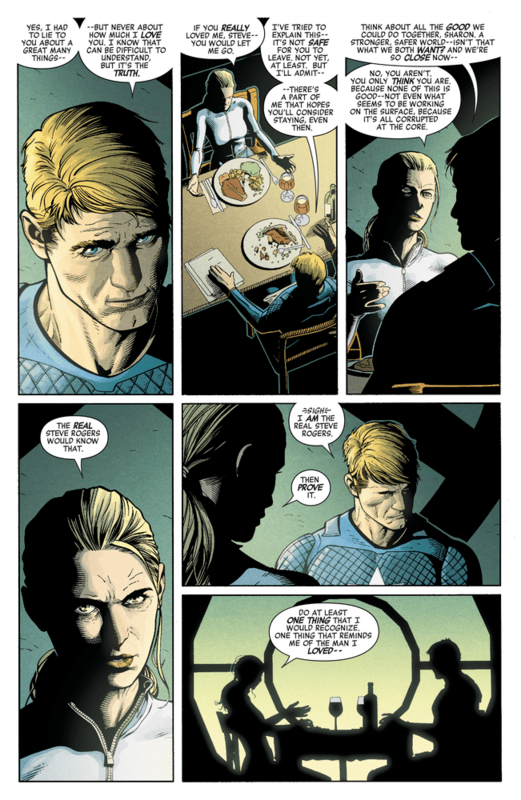 Later in the issue, we see Cap having dinner with Sharon Carter. Obviously Sharon is still not convinced that she’s talking to Steve Rogers, her lover so she asks for some proof; and that comes in the form of sparing the life of Rick Jones. 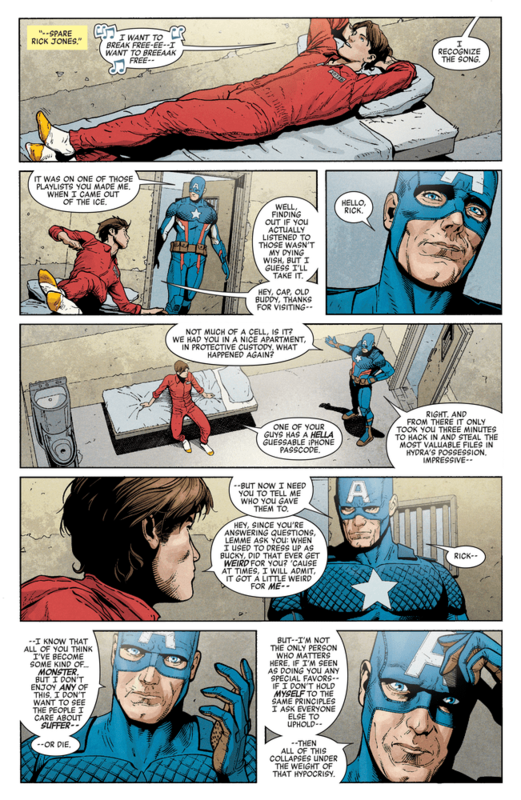 Captain America visits Rick in his cell and asks him for some form of acknowledgement or at least even uttering the word “Hail Hydra” to spare him from what’s going to happen. Funny that’s what Marvel is trying to tell readers who are still sticking with them through the whole Nazi-Cap phase. 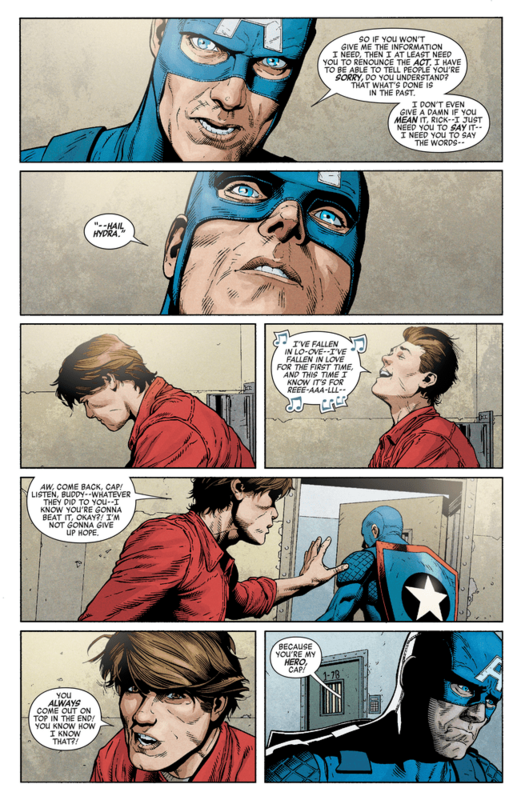 Also that look on Cap’s face as he leaves Rick Jones’s cell is just sad. Gotta hand it to Steve McNiven for the art. 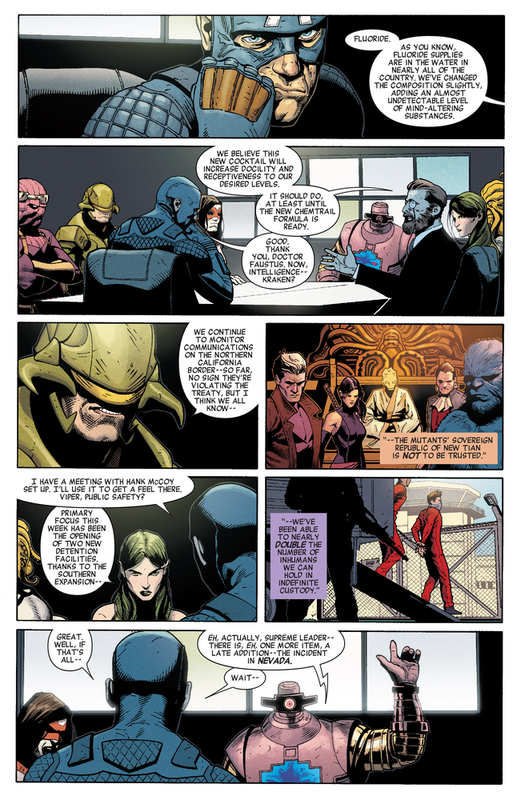 After a brief meeting with the new Madame Hydra, Steve decides that he must act on what he thinks is right (from the point of view of HYDRA and to best serve the organization). That means, he sends Rick to his death. 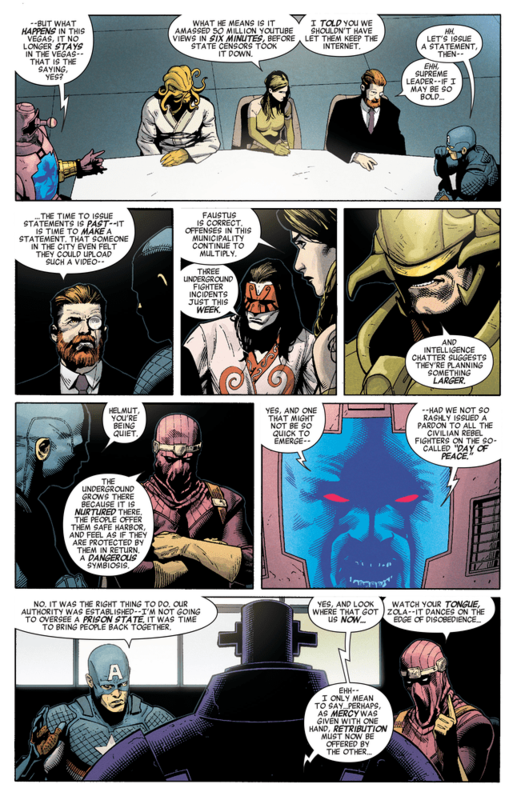 Oh and the final page will definitely turn Captain America from hero to villain to monster in that order. Previous story Darksiders III Leaked then Officially Announced!